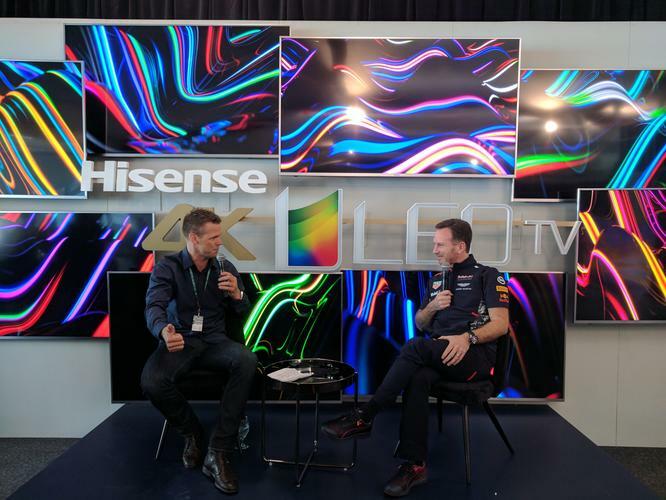 Former Gelong AFL star Lee Colber interviews Red Bull Racing Formula 1 boss, Christian Horner at the Melbourne 2017 Grand Prix while sitting in front of Hisense ULED TVs and launching the new Series 8 and Series 9 Hisense TVs. 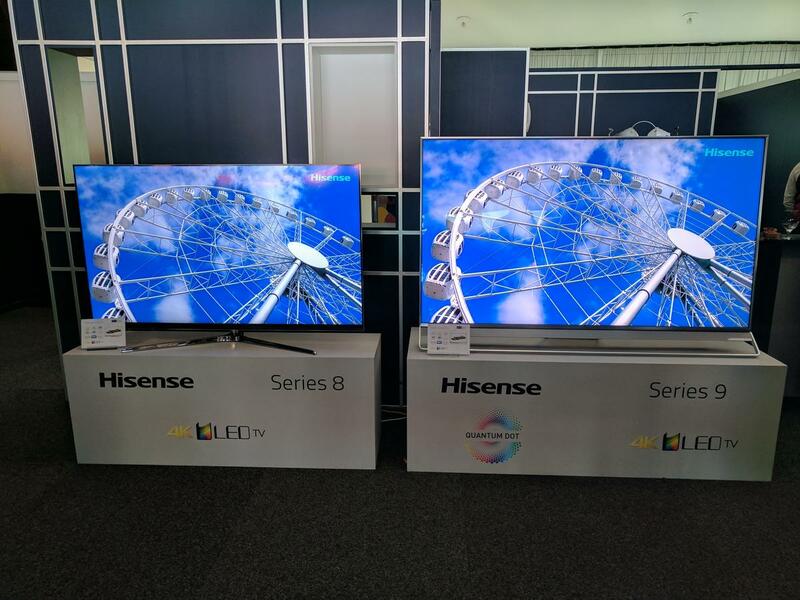 Hisense has displayed it's new Series 8 and Series 9 TVs - the successor to the world-beating Series 7 ULED TVs that won our Best Tech Product of 2016 award. Hisense Series 7 ULED TVs completely disrupted the television market last year by producing the one of the best TVs we'd ever seen for a fraction of the cost of premium-brand rivals. The TV helped Hisense become achieve number one market share in Australia last year. 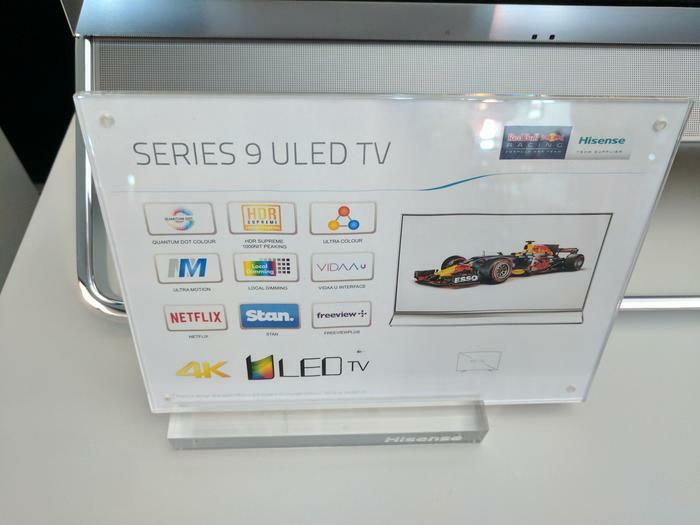 The new Series 8 and Series 9 TVs see the company entering the "Premium" market - which generally means they'll have nicer stands and styling for a lot more money. No pricing has been announced yet and we only know that they'll appear later this year. However, Hisense took the opportunity of the first 2017 Grand Prix race in Melbourne to show off the only two units in the country. So far they look suitably great but we'll reserve judgement until we've tested them and received pricing details. The Series 8 TV is available as 55-inch and 65-inch variants. It comes with cable management options and a large, shiny stand. We're told it uses technologies called HDR Supreme (which we suspect is a dynamic HDR contrast enhancer that we've seen on Samsung and LG's new TVs). Brightness peaks at 1,000 nits which is half as much as Samsung's Q9 QLED TV. Hisense also says the colour gamut is wider than last year's Series 7. 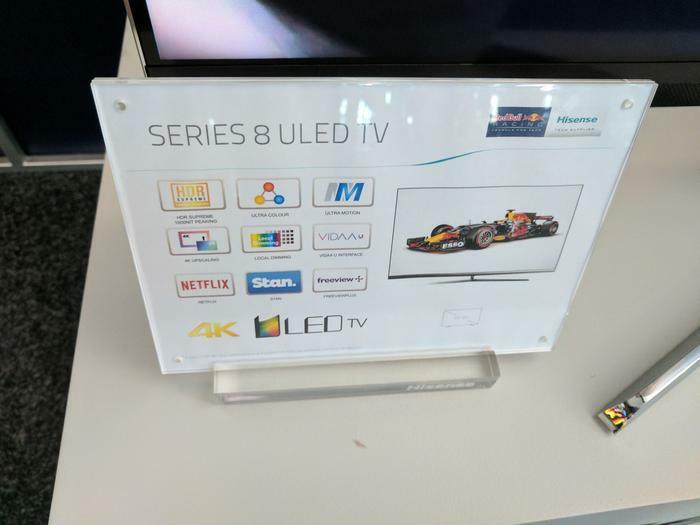 The Series 9 TV uses Quantum Dot technology (similar to Samsung) and is available in 75-inch and 85-inch variants and as such promises to be even brighter. Hisense Series 8 Feature card. Both models have a new, enhanced, single menu system called VDU which we're told will start-up faster than before (three seconds this time). Apps are said to start quicker at two seconds.